Russian President Vladimir Putin and Lomonosov Moscow State University Rector Viktor Sadovnichy, left, at a meeting with students held as part of the annual Forum of Student and Youth Organizations' Leaders, Jan. 25, 2017. 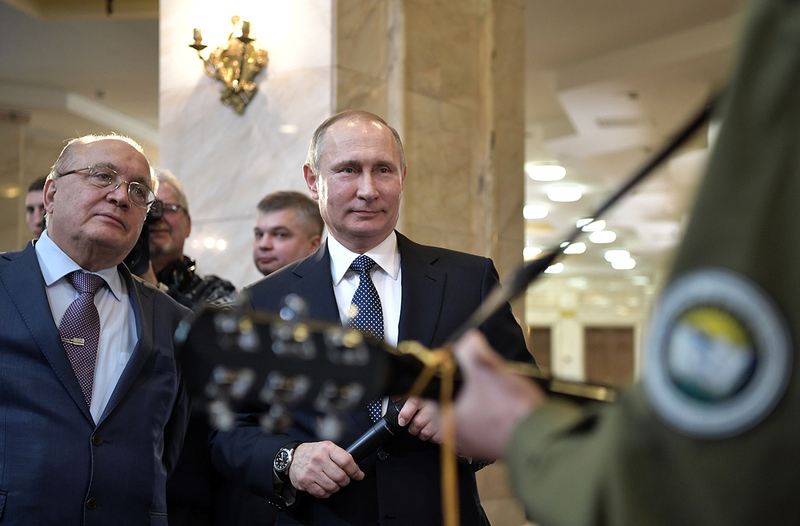 During a meeting with students of Lomonosov Moscow State University, Russian President Vladimir Putin surprised the crowd and joined a guitar rendition of the song, "14 minutes before the start." The event was held on occasion of Russian Students Day, which is celebrated every year on Jan. 25. The event began when a student took a guitar and started playing and singing the song, "14 minutes to start," which is dedicated to the first manned space flight. It soon became clear that not everyone knew the words, and the Russian leader helped by joining in.